Hello and thank you for checking out our stacks/ bundles. Each stack is priced per fat eight (55cm by 22cm) If you would prefer a FQ stack for your project you would have to pop 2 in the qty box. 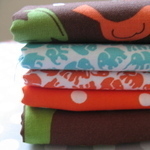 If we have sold out of a fabric in the stack you have chosen I will contact you with a aternative. Cloth stack ESSEX LINEN candy cane .. 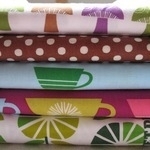 Fabric cloth stack - The Japanese Russian dolls … are coming ..